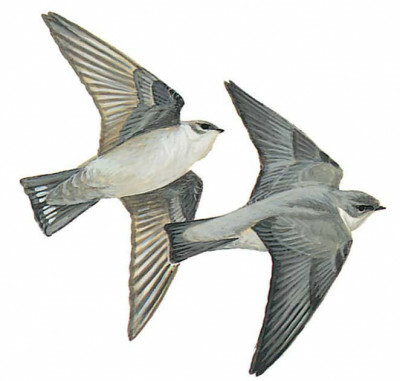 A small pale grey martin. Upperparts, especially back and rump, appear slightly greyer than wings; underparts almost white including chin, merging into pale mouse-grey undertail-coverts; less contrasting head pattern though ear-coverts sometimes darker than crown; white spots in spread tail distinctly visible when flying overhead or from above. Underwing pale grey with brownish-grey coverts. Flight action similar to Crag Martin.